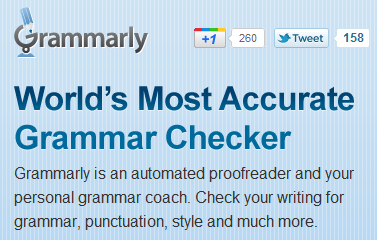 We all know that grammar accuracy is very important in any writings you do. It assures that your message or write ups would convey the perfect, desired meaning, the feelings and emotions because incorrect grammar would lead to miscommunications and confusion to your readers.This time to help everybody to achieve a decent grammar, I would introduce the World’s Most Accurate Grammar Checker-the GRAMMARLY. Grammarly is a simple online tool designed for proofreading, grammar and spelling checking with vocabulary and plagiarism detection. It is pack with 150+ grammar checks to help you free from erroneous punctuations, grammars and writing styles. Grammarly is recommended for academic, professional and personal use. Grammarly@Edu offers the two solutions for academic use; the K-12 Solutions and Higher Ed- perfect for student, instructors or even educational establishments. Grammarly is best for professionals in journalism, general business writings, legal and technical writings. It is also good for personal use especially for blogging and others interest. Grammarly is very easy and fast to use. To begin, you need to login then, copy and paste your text and choose your writings category and hit the Review button to check your grammar errors. After testing you can see the whole grammar review repot by clicking the SUMMARY button and you can export the results too. Tips: When you paste your text in Grammarly, you should back up it since it doesn’t preserve your hyperlinks, lay-out and symbols. Pros: A very user-friendly tool-it’s easy to signup, login, and navigate around. Grammarly has an add-ins for MS Word Processor that could help you to check your grammar offline. It recommends the best writing styles and vocabulary. The plagiarism tool is unique and helpful. Cons: Some informal words / new words are not yet supported. Not totally free but it offers a free 7 day trial. Considering that its more accurate than others I recommend these for you to try and find out why it's simply the best. I am a blogger, who candidly writes on interesting and trendy topics about technology but not an adept one with grammar matters. I only consider to at least do what is basic in good grammar and apart from just crossing my point in every post I made.I am happy that learn Grammarly because it’s help me to enhance my grammar instantly. My grammar checking experience with Grammarly turns into an exciting one since I can directly notice my error, being original in words and I love to get the perfect score. Check it out!